When it comes to delicious, out-of-this-world barbeque, you need two things: a cook who's passionate about great barbeque, and a top quality wood-burning barbecue smoker. This smoker grill is manufactured by Ole Hickory Pits. 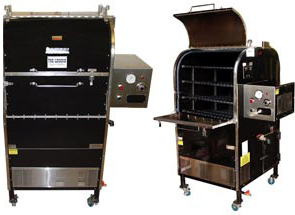 Using 30 years of expertise in building world-class barbeque equipment, Ole Hickory Pits created the original patented Convecture Tri-Oven design used by homeowners, restaurants, caterers, club food service organizations, contest cookers and just about anyone else who wants to produce outstanding, mouth-watering barbeque. This unique method of heat and smoke circulation has produced countless contest winners and it will make a great "Pit Master" out of you.